The Olmsted Falls School District has finalized a contract to provide bus maintenance services to Fairview Park City Schools. This new agreement, which goes into effect April 1st, will generate a new revenue stream for our District while providing a much-needed service for nearby Fairview Park. This is not the first time Olmsted Falls School District’s Transportation Department has entered into a regional agreement of this type. The District also provides maintenance and fuel services for Lakewood City Schools, as well as the City of Olmsted Falls. Click here to read an article from last week’s Sun Post-Herald about this new partnership with Fairview Park City Schools. Individual meetings for parents of next year’s kindergartner students were held at the Early Childhood Center on March 4th & 5th. Any parent of a child who still needs to be enrolled in kindergarten for the upcoming 2010-2011 school year should contact the Early Childhood Center as soon as possible by calling 427-6360. Children must be 5 years old by August 1st to enroll for kindergarten in the Olmsted Falls School District. The District is frequently contacted with questions regarding early entrance of children into kindergarten. According to Ohio Revised Code, if a child does not turn age 5 by the District cut-off date (August 1st) but turns 5 by January 1st, the parent may request that the child be tested for possible placement into kindergarten. Children who do not meet the mandatory cut-off date (August 1st) cannot be admitted into kindergarten unless they meet the criteria for early admission in the District’s Acceleration Policy for Advanced Learners. To discuss the appropriateness of early entrance into kindergarten for an individual child, please contact Olmsted Falls Early Childhood Center Principal Gina Sanfilippo at 427-6360 or Director of Student Services Merritt Waters at 427-6140. 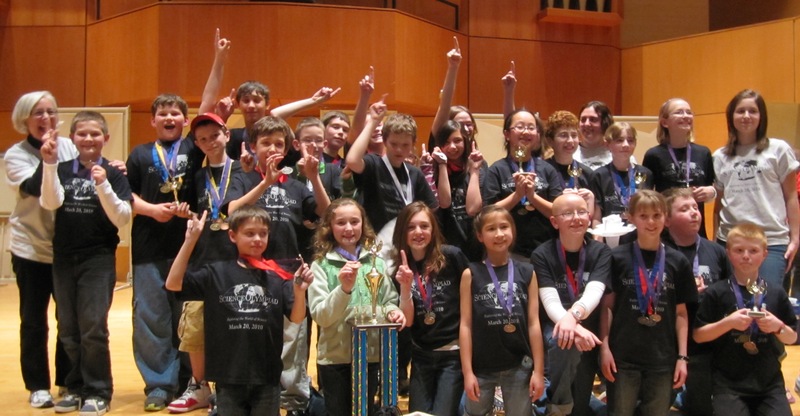 On Saturday, March 20, the Olmsted Falls Science Olympiad team (made up of 4th, 5th and 6th grade students) competed in the Elementary Science Olympiad HELD AT Cleveland State University. The team from Olmsted Falls competed against 21 other teams from schools throughout Northeast Ohio in 24 different events. The team medaled in 15 out of the 24 events, and took 1st place overall! Congratulations to this outstanding team of students, as well as to their parents and coaches. Click here for a complete overview of winners by event. Olmsted Falls School District is currently seeking to add to its roster of substitute school bus drivers. In addition to substitute driver positions, a full-time driver vacancy is anticipated for the 2010-2011 school year. This is a great opportunity for parents or local community members interested in a new career. Applicants are encouraged to apply on-line, and then notify the Bus Garage via phone at 427-6350. Note: Once on-line, please select the “Start an application for employment” option, and follow the instructions on the screen. Last week our District was profiled in a segment for Channel 3 (WKYC) on healthy school lunches. Reporter Kim Wheeler selected Olmsted Falls as one of the featured districts for the leadership role our District has taken when it comes to ensuring students have healthy options in their school cafeterias. Her camera crew visited the Bulldog Café at the Intermediate School. Click here to view the news clip on-line. 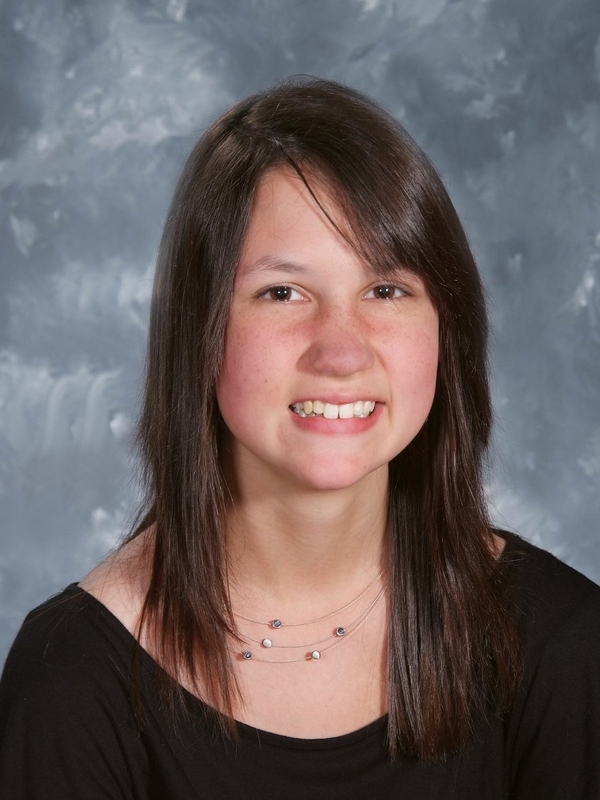 Congratulations to Olmsted Falls High School student Jessica Albright for recently being named Sun-Post Herald Student of the Week. Please click here to read the article about Jessica. 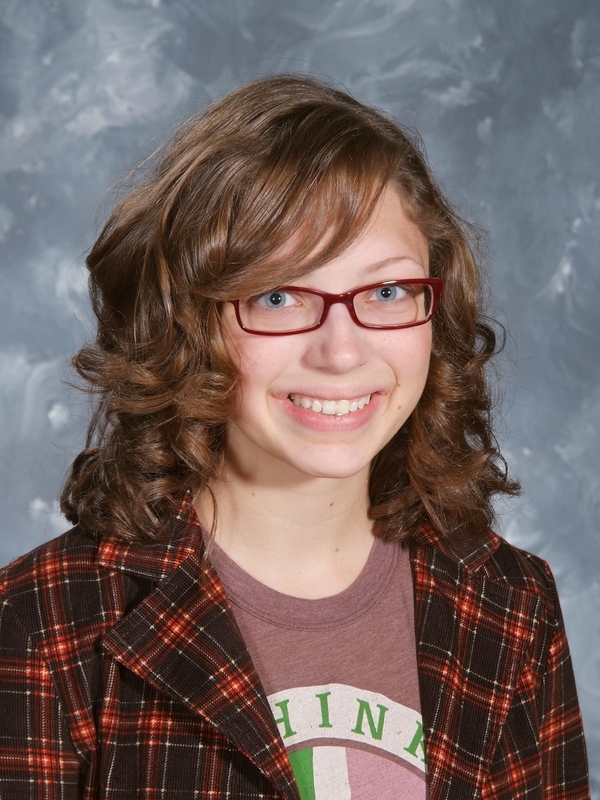 Olmsted Falls High School sophomore Hayleigh Sanders was awarded a $200 cash prize for her entry in the Stop The Hate: Youth Speak Out! essay contest, sponsored by the Maltz Museum of Jewish Heritage. The contest asks students to describe an act of discrimination, reflect on their own response and write a 500-word essay with a plan of action to affect changes. Hayleigh Sanders’ entry earned 2nd place in the High School – 10th Grade division. Congratulations Hayleigh! 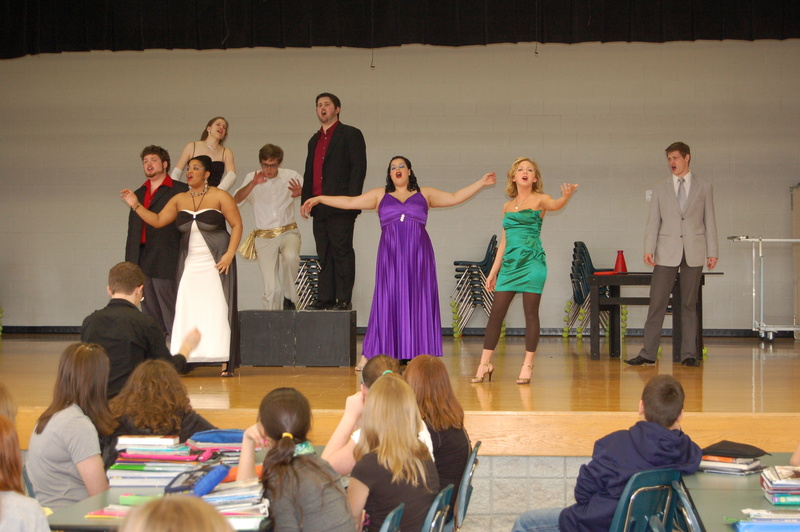 Students at Olmsted Falls Middle and High schools were treated to a live opera performance last week thanks to the Conservatory Outreach Department at Baldwin-Wallace College. A cast of Baldwin-Wallace College students performed the complete second act of the acclaimed opera “Too Many Sopranos,” during two performances in our District – one at the High School in the morning and one at the Middle School in the afternoon. Students in the audience applauded the efforts of the talented performers and had an opportunity to ask questions of the cast following each performance. Community partnerships with institutes of higher learning such as Baldwin-Wallace help enhance educational programming and opportunities for our students. During the month of March, Olmsted Falls Intermediate School participated in the “Pasta for Pennies” program to benefit children with Leukemia and Lymphoma. Coordinated by the school’s K-Kids group, the program ran from March 1st – 19th. The campaign kicked off with a special assembly featuring a representative from the Leukemia Lymphoma Society (LLS) to introduce the program and explain to the students what Leukemia and Lymphoma were – and how their change would help researchers find a cure for these cancers. Pennies, and other change or money, was collected in boxes in each homeroom. K-Kids gathered each Friday morning during the campaign to count all of the change. During the second week of the program, K-Kids members also volunteered to sell “paper pennies” which were hung around the cafeteria. In all, a total of $2,198.72 was collected and donated to the Leukemia Lymphoma Society (LLS) by the students of Olmsted Falls Intermediate School. A special congratulations goes to Mr. Schafer’s homeroom, who alone collected more than $400 for the cause and were awarded a pasta lunch from Olive Garden restaurant. Middle School students provided 5th graders with a personal preview of the U.S. Constitution last week as they shared their Constitution Book projects. As part of their government unit on the U.S. Constitution, 8th grade students recently created “Constitution Books” which covered elements relevant to their 8th grade curriculum as well as curriculum elements relevant to their 5th grade counter-parts. The two grade levels came together in the cafeteria at the Intermediate School – just a short walk for 8th graders through the new enclosed breezeway connected the two buildings – to review the U.S. Constitution together through this innovative collaboration. 5th graders, who were just about to begin their own U.S. Constitution units, were treated to a preview by their older peers who reviewed their “Constitution Book” projects page-by-page in small groups. According to the study conducted by the U.S. Department of Health and Human Services, 48% of all U.S. teenagers, ages 12 – 17, say they have been a passenger in a car where the driver was texting while driving. As promised during the recent operating levy campaign, the District is moving forward with the hiring of two additional teachers for the upcoming 2010-2011 school year. Postings for these two new positions, as well as several other positions that will need to be filled due to retirements or staff members leaving for family reasons, will be made public in the very near future. With anticipated retirements, teachers leaving the District for other various reasons, and the two additional teaching positions being implemented with the passage of the February operating levy, the District expects somewhere between 6 – 8 new teachers being hired for the 2010-2011 school year. As has been the District’s practice, all employment vacancies are posted on the District’s website. To see present employment opportunities with the Olmsted Falls School District, please click here. The latest issue of the School Report will be delivered to homes of all District residents over the next few days. The on-line version can be downloaded and viewed immediately by visiting our District website. Click here to be taken to the School Report link. This week is national Right-To-Read Week and there have been a wide variety of activities taking place throughout the buildings. 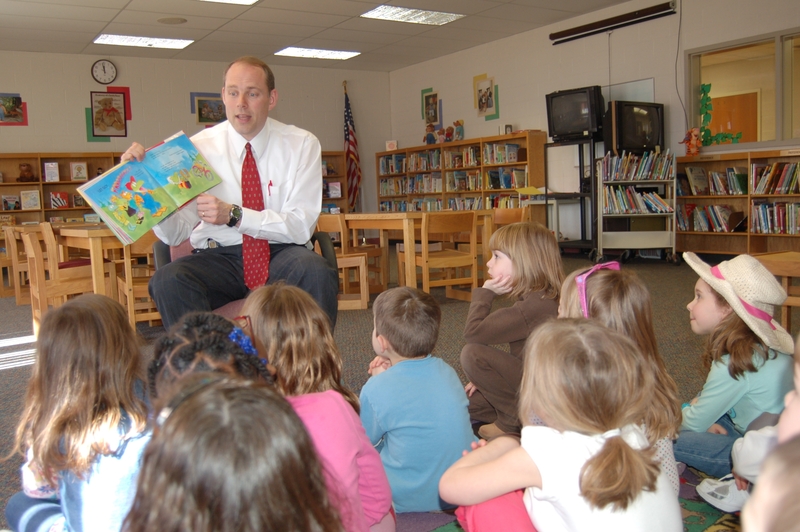 I had the pleasure of being a guest reader for a special kindergarten story time at our Early Childhood Center. Congrats to our staff and parents for going above and beyond to inspire and nurture a love of reading in our students! Olmsted Falls City Schools and our local PTA are proud to present a special series of wellness events for parents and students. The “Parent Academy: Power Up Moves and Food” events are made possible through a grant from the Ohio Department of Education. These fun and informational events will include dinner, preparation and enjoyment of a healthy snack, physical activity for the kids, and an interactive presentation for parents that will cover topics like portion sizes, food labels, and purchasing produce. The events are free, however an R.S.V.P. is required. Be sure you have marked your calendars for the OFHS Masquers Spring Musical production, “Bye Bye Birdie.” Performances are scheduled for April 9th and 10th – both begin at 7:30 p.m. in the Olmsted Falls High School Auditorium. Tickets are available at the door or can be reserved in advance by calling 427-6070. Ticket Costs: $7 each adult; $5 each students / senior citizens. John Oravec as "Albert Peterson"
Patrick Laycock as "Conrad Birdie"
Maddi New as "Kim MacAfee"
Tessa Hongosh as "Rose Alvarez"
The 8.7 Mill Operating Levy passed by our community on February 2, 2010 will begin to generate needed revenue for our District beginning in January 2011. While current projections indicate this new levy will keep the District afloat financially for three years, the Board of Education continues to discuss ways that the funds could be stretched further. 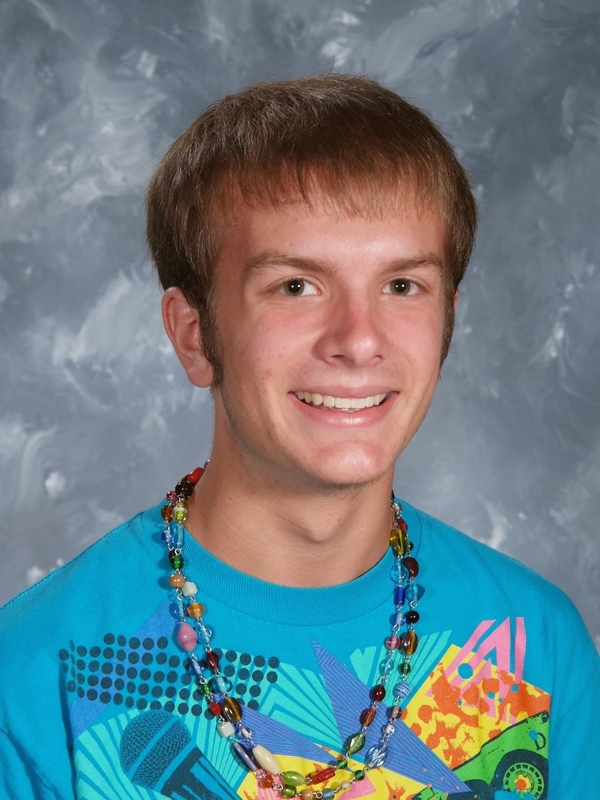 Congratulations to Matthew Harris for qualifying for the Ohio Geographic Bee. 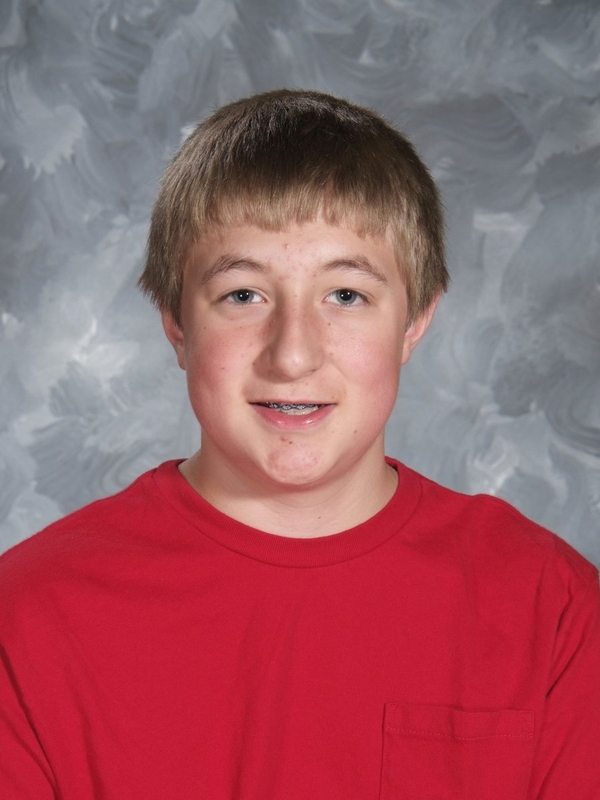 Congratulations to 6th grader Matthew Harris for earning a chance to compete in the 2010 Ohio Geographic Bee at The Ohio State University campus on April 9th. Bees were held in schools with 4th through 8th grade students throughout the State of Ohio to determine each school’s Geographic Bee winner. School-level winners then took a qualifying test which they submitted to the National Geographic Society. The top 100 scores were then invited to compete at the State level. This is an outstanding accomplishment. Good luck to Matthew next month! 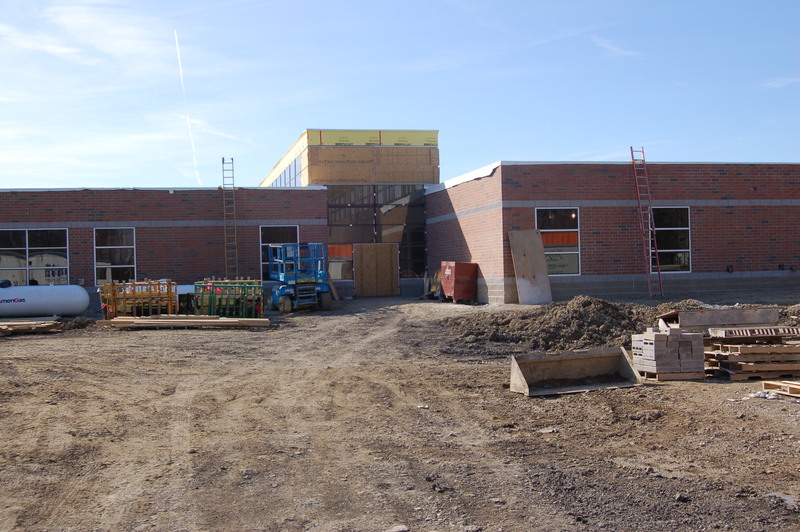 The $7.7 million State-funded expansion to Olmsted Falls Middle School is progressing extremely well. 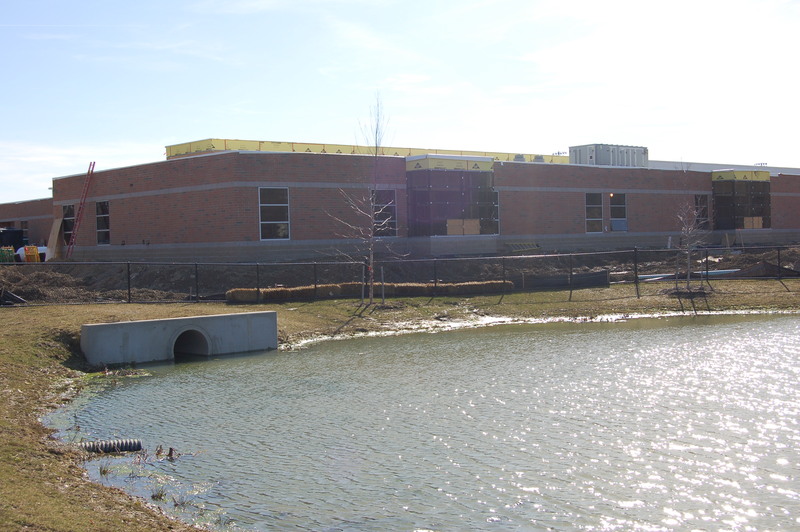 The project, made possible by a funding award to Olmsted Falls School District from the Ohio School Facilities Commission’s Exceptional Needs Program, is currently ahead of schedule with an anticipated completion date of July 2010. The project is also currently under budget by approximately $400,000. The Olmsted Falls Intermediate School PTA along with volunteers from the recent levy campaign have partnered to present a special workshop on school funding in Ohio. The workshop, scheduled for Saturday, April 10th from 10 a.m. to noon at Olmsted Falls Middle School, is open to all Ohio voters interested in learning about the current state education funding policies and potential opportunities for reform. Click here for additional information. “Operation: Medicine Cabinet” will be hosting drop-off locations in our area on Saturday, May 8th from 9 a.m. to 2 p.m. The purpose of “Operation: Medicine Cabinet” is to provide an opportunity for people to safely dispose of any outdated or unwanted prescription medications. WOULD YOU KNOW IF SOME OF YOUR PILLS ARE MISSING? Monitor: Take inventory of all prescription and over-the-counter drugs in your home and keep track of refills. Secure: Lock up medications in a secure location and control access. Dispose: Remove any personal identifiable information from prescription bottles before discarding. Do not flush medications down the drain or toilet. Seek proper medication disposal methods (such as Operation: Medicine Cabinet Drop Off Locations). Inform: Ask friends and family to safeguard their prescription drugs as well. The Olmsted Falls Board of Education honored members of the High School Academic Team at their March 18th meeting. Team members provided a demonstration of their academic skills for Board members and guests. In addition to winning the S.W.C., the OFHS Academic Team also won the NEOAL (North East Ohio Academic League)! Finally, this past weekend, the Academic Team participated in a Tournament at Case Western Reserve University and placed 2nd overall with teams from Ohio, Michigan, and New York participating. Congratulations to the High School Symphonic Band and the High School Treble Choir for receiving high marks during their trip to the District Contest. Judges awarded our Symphonic Band with an “Excellent” rating. Our Treble Choir was rated “Superior” by the judges and earned a trip to compete at the State level in April. Congratulations and best wishes to these talented students! Our Middle School recently had 114 individual entries in 42 events for the Ohio Music Association Solo and Ensemble Contest held at Midview High School. Eighteen of our students received “Excellent” ratings; 61 students received “Superior” ratings; and 24 students received “Good” ratings. Click this link to review individual student ratings. Congratulations to all of our wrestlers on their accomplishments this year! Top two high school student Relay for Life fund raisers, Katie Kopp (left) and Tabitha Wrege (right), stand under a banner which hangs in the high school hallway. Both students serve as captains for Relay for Life teams. Just 85 days remain until the Relay for Life event, being held at the Olmsted Falls High School stadium starting at 12 noon on Saturday, June 12th. To date, Olmsted Falls School District has 32 teams registered, 292 participants registered, and $13,107.41 raised. The goal of the Relay for Life committee is to register 40 teams and raise $25,000 for the American Cancer Society. For additional information, please visit www.relayforlife.org/OlmstedFalls. Congratulations to Mrs. Haviland, who has been named the 2010 Ohio PTA School Nurse of the Year. It has just been announced that Olmsted Falls School District nurse, Darla Haviland, has been awarded the Ohio PTA School Nurse of the Year Award. 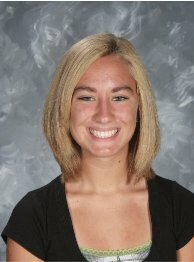 Mrs. Haviland’s knowledge, compassion, and diligence will be recognized at a formal awards banquet in Columbus in April. Congratulations to Mrs. Haviland! The students, families, and staff of Olmsted Falls Schools are truly fortunate to have you here at OFCS. Don’t miss this opportunity to shop for gently used children’s clothes, toys and gear, as well as maternity wear. People line up from miles around for this annual sale. For additional details on this event, please visit the OECPTA website by clicking here. FALLS-LENOX / INTERMEDIATE SCHOOL LUNCH MENUS NOW AVAILABLE ON-LINE Effective March 1st, lunch menus for Falls-Lenox Primary and Olmsted Falls Intermediate Schools will only be available on-line. Parents can download monthly lunch menus by clicking the “Lunch Menu” link located on the left-hand side of both the Falls-Lenox and OFIS website homepages. Please contact the Food Services Office at 427-6441 with any questions. Thank You, Olmsted Kiwanis, for all you do in supporting the children of this community. 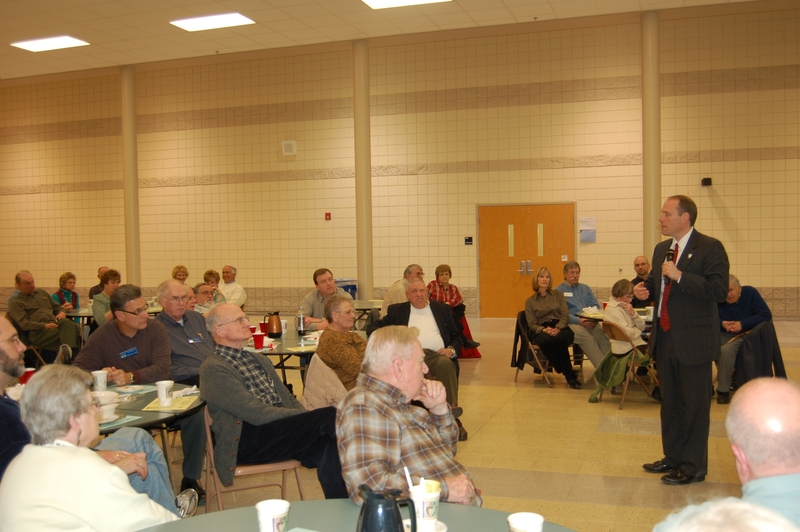 It was our District’s pleasure to host the Olmsted Falls Kiwanis Club for their monthly meeting earlier this week. More than 50 attended this special meeting held in the Olmsted Falls Intermediate School cafeteria. The meeting featured a presentation by Dr. Hoadley on the “State of the Schools,” as well as a personally guided building tour by OFIS Principal Mr. Don Svec. Please click here to download a copy of the “State of the Schools” presentation and view photos from the event. Members of the Olmsted Falls Forensic Team competed in the State Tournament last week in Shaker Heights. Four members of the team advanced to the final elimination rounds. Team members Shom Mazumder (Junior) and Nick Macek (Junior) advanced to the Semi-Final Student Congress. Natalie Brdar (Junior) advanced to the quarter finals for Impromptu Speaking and finished in the top 20 in the State. Max Miller (Senior) made it to the final round for Humorous Interpretation and finished 6th in the State. Congratulations to these four students and the entire Forensic Team for their continuing success. 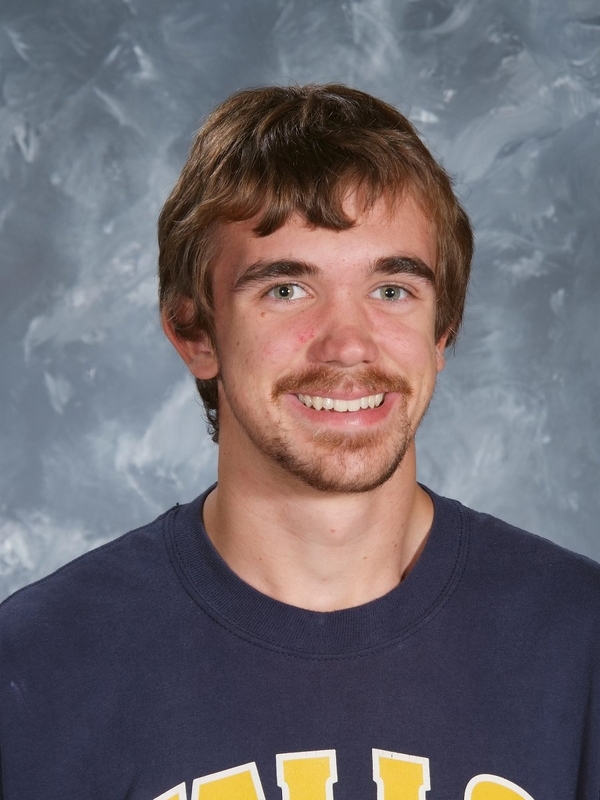 Congratulations to OFHS Senior, Colin Brady, who has been selected to the Ohio High School Ice Hockey Senior All Star Game in Columbus! The Olmsted Falls Wrestling Open will be held this weekend, March 13 and 14 at Olmsted Falls High School. Contact Tracey McGrain at 440-427-6109 from 9:00AM – 3:30PM and 330-483-6001 on evenings before 9:30PM. You may also print a registration form by clicking here. The annual Olmsted Falls Open 3 on 3 Basketball Tournament will be held on Saturday, April 24th. Entry forms are available in the Student Office at Olmsted Falls High School. The deadline for entry is April 17th. Please contact Roberto Sosic at 440-759-2774.